Home Uncategorized	All The Questions You Had About Starting A Blog ANSWERED! Blogging changed my life… can it change yours? If you’ve been looking for ways to make money from home and you’re interested in blogging, but have some SERIOUS questions, then I’ve got you covered! I understand what it’s like to have a THOUSAND questions in your head before starting something, so I’m here to answer them! And down below you’ll find a list of all the questions I cover in this post AND, if you see an important one missing, just let me know in the comments down below. I’ll be happy to answer it as well and possibly add it here! We wanted to experience life outside of our tiny, dark apartment, and a car that kept breaking down in the middle of WINTER. $3,000 per month in 3 months after launching... we were stunned and we know we couldn’t have done it without God’s help (seriously). Launching a blog was one of the best things we could have ever done! And since we’ve started blogging, things in our lives have looked completely different. We went from living below the poverty line and living paycheck-to-paycheck to making over $10,000 a month and traveling to countries like Morocco, Japan, and France. I’ve been able to wake up when I want to and see parts of the world I would never have gotten to see otherwise. And I know that it will give YOU the ability to quit your dead-end job, spend more time with your family and friends, and give you incredible time and money freedom. There are honestly so many opportunities blogging will give you. We have SO MANY reasons for wanting to find a great way to work from home. But… is blogging the right way for you? And the best part is that YOU are in control of how much you make. There’s no boss saying how much of a raise you can have this quarter or what kind of pay you can start off with. It’s all up to you and the amount of time and money you invest in your blog. Also, if you’re needing to make more income very quickly, then I would not consider blogging as an option. There are companies that offer online jobs and start paying within a couple of weeks. So what do I blog about? How do I find my niche? I feel like there are too many people in my niche. Should I even bother? I feel like my niche is too small. Will anyone read it? Where do I even start? It’s overwhelming! What are the first steps in starting a blog? I feel like I’m going to FAIL as a blogger. I do not have confidence in myself for this. Any advice? How do I make money with my blog and niche? How do I get people onto my site so that I can start making money? I don’t have the money to buy hosting, what should I do? I need to be working because I need the money, should I still consider blogging? I’m not tech-savvy… Is this complicated? How do I find the right name for my blog? Where do I find topics to write on? I don’t feel like I’m a good writer, what should I do? So check them out and make sure to let me know if you still have any more questions! 1. So what do I blog about? How do I find my niche? 2. I feel like there are too many people in my niche. Should I even bother? 3. I feel like my niche is too small. Will anyone read it? 4. Where do I even start? It’s overwhelming! 5. What are the first steps in starting a blog? 6. I feel like I’m going to FAIL as a blogger. I don’t have confidence in myself for this. Any advice? 7. How do I make money with my blog and niche? 8. How do I get people onto my site so that I can start making money? 9. I don’t have the money to buy hosting, what should I do? 10. I need to be working because I need the money, should I still consider blogging? 11. I’m not tech-savvy… is this complicated? 12. How do I find the right name for my blog? 13. Where do I find the time to blog? 14. Where do I find topics to write on? 15. I don’t feel like I’m a good writer, what should I do? First of all, you want to grab a pencil and a piece of paper (or open a document on your computer), then start writing down your interests and passions (I know, sounds like a no brainer, but there’s more to it, I promise!). Also, write down your skills (and this doesn’t have to be something you learned in school). Are you great at certain aspects of parenting like getting your children to sleep through the night after just a couple months? That’s a skill! Then, group together the passions, interests, and skills that all match up. What is the common theme? This is going to help you figure out the kind of topics you want to write on. You can also study other bloggers in the same niche and how they’re able to make it work. Now if you’re into multiple things that don’t seem to line up, then know that there usually is a common factor in between them all. So for instance, if you like budgeting, but you also love to cook, you can connect them both by writing on recipes you can make – for under $5 or $10. – Just so you know, it really IS ok to blog about more than one topic; we do and it’s turned out very well for us! You just have to find out who you’re writing to and find ways to make the niches fit together. So for instance (going with the example above), does your ideal reader love to find smart ways to save money, but she’s a bit of a foodie? Well, how can you help her explore her foodie side while still staying on a budget? You can also look into the topics you find yourself regularly talking or reading about. And it’s ok if you’re not an “expert!” I wasn’t when I first started blogging. But you become an expert as you write and learn more on the topic over time. As you search for the questions that aren’t being answered and learn from the bigger bloggers, over time you’ll gain more experience and become a well-trusted voice in your niche. YOU can become the expert. Quick Note on Making Money with Your Niche: It’s a common concern to want to make sure that they can actually make money with their niche. I get it; unless you’re blogging as a hobby, who wants to write long-term and not see income (no one)? And if this is something you’re worried about, then head down to question #7 How do I make money with my blog and niche? How to create your own money-making blog here. The easy answer is… yeah! Totally! My husband and I both write on very popular subjects and were able to get over 150k people on our site in our second month after our blog launched. I understand that there are bigger bloggers that are successful in the niche you want to write on, but you have to realize that there are millions of people on the internet, and those bigger bloggers do NOT have a monopoly on all of them. You can totally have a blog on DIY and get a great following of people who aren’t readers of these other bigger bloggers. Also, you can look at the blog topics others are writing on and see how you can provide value where they don’t. And you can do this in TWO ways. So for instance, let’s say a big money blogger is writing on “How to Start a $1,000 Emergency Fund Quickly.” Well, they might not be discussing an important aspect that you see as obvious. And that could be the fact that they aren’t mentioning how you can save $1,000 faster by focusing on creating a separate bank account so you don’t dip into your savings. The SECOND way you can do this is by looking in the comments section of that same post. What questions are people asking that the blogger didn’t answer in the post itself? Find those questions, answer them yourself, and write a more comprehensive blog post that will create a loyal readership. You want to find ways you can out-perform the other bloggers so you can start seeing bigger results faster. Don’t blend in – stand out for the quality of your work. Heck yeah! I know people who have a blog on Medieval history and have a HUGE following! Talk about niche! Now there are two parts to this and the first part is, find where those people are congregating. Facebook groups are an AMAZING place to find people in very specific niches. Once you join a few, you can start seeing what kind of questions people are asking and what people are talking about. This will give you a good idea about what people in that niche are actually interested in, instead of shooting in the dark hoping that people will read your blog post. Then you can start showing yourself to be a helpful person in the group by answering their questions (or finding answers for them for the ones you don’t know). Once you’ve started doing this, then you can start sharing your own in-depth blog posts on the topics that get asked and discussed the most frequently (as long as it’s not against the group owner’s rules). You want to become an expert to the members in those groups by providing high-quality content so that you’re their go-to when it comes to being a helpful resource. The second part is dedication. It can (not always) take a bit longer to gain traction with a smaller niche. But if you’re consistently putting out high-quality posts that give your readers a lot of help, then you’re going to gain a loyal following. Side Note: Down below, I also talk about how to get people to see your blog so that you can start making money in question #8. PLUS: You can also start up your own Facebook group as you create a following so that you can keep them updated with new posts and create your OWN community of people who love you and love interacting with each other and get readers onto your blog (and groups are favored by Facebook which means they’ll be showing up first in people’s feeds a lot of the time as well as your follower’s Facebook notifications). Last thoughts on starting a small niche blog… getting subscribers (people who give you their email so that you can send them out newsletters) will keep people interested in your blog and coming back over and over again. It’s something I wish I had done straight away when I was a new blogger. Also, here’s another reason why you NEED an email list when first starting out: 99.9% of the people who go onto your site are going to leave… and never come back. So if you can get those people to sign up for your weekly newsletter (let’s say by giving them a free offer – also known as a freebie – so for example, a list of 10 tips that will help them lose 5 pounds in a week), then you can update them every time you publish a new blog post. And when you do that, then, of course, they’re going to come back to your blog. ALSO, if at some point in the future you decide to sell an ebook or course or some other kind of product, you’ll have an email list of loyal readers who will buy from you. And a great email provider (which is a service that allows you to gather people’s emails and send a newsletter to them) to start off with would be Convertkit; they’re great for people who aren’t tech-savvy, like me! One of the best things to do when you’re feeling overwhelmed on where to start is to write down just a few things you want to focus on and research over the course of a few months until you’ve mastered it. So for me, it was… writing 25-50 blog posts and put my focus into using Pinterest for my blog (which I talk about in question #8) and learning as much as I could with that ONE social media platform (I didn’t go focusing on Facebook, and Instagram, and Twitter, just Pinterest). I also focused on blog topics that other big bloggers were writing on that would get my blog a TON of readers. So what pins on Pinterest had gone viral and why? What were they about, what did they look like, what kind of titles did they use? You want to get very focused on just a few things until you’ve mastered them or you feel that you can add one or two more things. This is a great way to make sure you’re getting rid of that overwhelmed feeling and staying on track towards your goal. It also keeps you from getting discouraged and helps you move onto the next BIGGER thing (like affiliate products – which I’ll talk about down below). Last thought: Make sure that the things you’re focusing on are going to give you the biggest results sooner. So for me, I wanted to get a lot of readers onto my site and fast, so I put my focus on Pinterest which gave me over 150,000 readers in my second month. Crazy right? If you have bought hosting, then your first step would be to set up the look of your blog (design, menu items, a logo which you can easily create with Picmonkey.com for free, colors, etc.). Then get the necessary WordPress plugins (plugins are apps you can easily add to your site that will give your blog certain benefits) that would protect your site from hackers and show how many readers your site has had each day (ex. Jetpack and Google Analytics). Next you would start brainstorming 25-50 blog post ideas (doesn’t have to be all in one sitting but over a few days), and start writing them out. Lastly, you would publish those posts and start sharing them on sites like Pinterest (which I talk about more here). And as I mentioned in the last question (Question #4), you want to write down just a few things you want to focus on for a few months (this could be 3-6 months of your time), so that you don’t get overwhelmed. It’s very important to do this so that you are more directed and you’re getting to where you want to go faster (if you haven’t read the answer to question #4 yet, then definitely check it out – I go over what I focused on in my first few months of blogging that led me to where I am now). Lastly, make sure to find people who inspire you. When first starting out, it’s important that you find bloggers who have been where you’re at and have actionable and helpful content for you to refer to. Being new to blogging is difficult, but when you have the right people guiding you along, it can go a LONG way! So here’s what you need to do. Find big bloggers who had a hard time starting their blog (like Sarah Titus who was a single mother of three who made $10,000/mo blogging within a YEAR). It’s good to understand that you’re not alone and that there are others who have gone before you and did it too. I’m sure they struggled a LOT with their self-confidence as well! And you know that saying that goes, “Shoot for the moon. Even if you miss, you’ll land among the stars?” Even if you’re shooting to make a certain amount of money after a certain amount of months and miss, you’re still going to land farther than if you had done nothing. Especially if you’re working hard and staying focused on just a few things at a time… how could you not see results (this was something I had to reason against when I first started)? You also want to keep in mind the quote, “In a year from now, you’ll wish you started today.” That was what my husband told me when I wanted to quit (that’s right, I wanted to give up… just a few months before things took off). Riad Yasmine… one of our favorite traditional Moroccan inns. Ad Revenue: This is where you can join ad companies like Adsense by Google (great for beginners!) or Mediavine. Once you join, they will display ads on your site and you will get paid for how many people click on the ad and how many people see the ad. It’s the most passive and easy way to make money blogging! Affiliate Products: When you join an affiliate program, you agree to promote a certain product or products. And when someone clicks through your special tracking link (that the program gives you) and makes a purchase, you’ll get a commission at no extra cost to them. Some great examples of this for beginners would be Amazon or Target’s affiliate program. Just make sure it’s something you’ve used yourself and love! That way you don’t recommend something that hurts your reader’s trust in you. Products: Creating your own product, whether it’s an ebook or a class (written or video), on a certain topic is an amazing way to make income with your blog. Especially if you have a smaller niche, but I’ll talk about that more below. Sponsored Posts: A sponsored post is where a brand will pay you to write about them and/or their product. A good way to find sponsored post opportunities are on sites like blogher.com. As you learn how to get readers onto your blog, the most immediate way to make money is through ads, especially since it’s SO passive. However, offering your readership affiliate products and your own products (which could be an online class or written material) is also a great way to make money with your blog. So for instance, if you’re writing on herbal remedies to improve health, you could create a downloadable PDF that will show people the different herbal remedies that they can start off with as beginners and what it does for their health. And as an affiliate, you can also promote other people’s herbal remedy kits on Amazon (as an example). Lastly, you want to look at other blogger’s in your niche and see how they’re making money. What products are they promoting and creating themselves? Side Note: Just make sure that as you’re creating a following to promote products to, you also have an email list with someone like Convertkit (great if you’re not tech-savvy). Convertkit helps gather people’s email addresses (when they sign up for your newsletter) and allows you to send them emails weekly. Promoting to your email list is the BIGGEST way to make money with your blog. These people trusted you enough to give you their email which means they’re probably going to trust you enough to buy what you’re sharing with them. Also, they’re already there, so you don’t have to get new people onto your site and HOPE they buy your affiliate or personal product. Fez, Morocco has some incredibly beautiful winding streets. The ONE way I got readers onto my site fast as a new blogger was Pinterest. I was able to get 150,000 readers in my second month of blogging. Side Note: You can find these keywords by using the Pinterest search box. Just start typing in a word like “weight loss” and see what pops up. The first search results are the most searched for on Pinterest. Next, you’ll want to pin 10 of other people’s pins onto those boards and make sure that each pin has 800+ repins (which you can find at the bottom of the pin when you click on it). This just shows Pinterest that you’re pinning high-quality content and helps the boards to do well. ALSO, you’ll want to make sure each board has a pretty cover and follows a theme (color or image theme) to attract new followers. You’ll also want to make sure you’re pinning other people’s content to the different boards daily (30+ pins spread throughout the different boards). Pin: This is an image that a person on Pinterest can save for later (example: recipe, DIY project, etc.). Board: Think of this as a pin-board. You can have different boards (such as a DIY board) and save a DIY pin onto that board. Pinning: This is the exact term for saving a pin image. Repin: This is how many times a pin has been saved by other people. Think of repins like Facebook likes or shares. “I just see an image when I see the pin. How do I actually get to the recipe (as an example)?” – You will want to click on the pin image. Once it’s made big on the screen, you will click again and it will take you to that person’s site with the actual blog post. Then, you’ll want to start practicing pin making. There are sites like Picmonkey.com which allow you to create images for free. BUT, for a small yearly charge (the price of a few Starbucks drinks), you can get more design abilities and fonts (and not have to see their ads which tend to slow things down). You can practice pin making by looking at other people’s pins (pins that have done well) and creating images inspired by theirs. IMPORTANT Side Note: Just make sure you have 4+ different bloggers for pin examples. You DO NOT want another blogger to see that you’re solely using their pin style. And you want to make sure it’s not a full-on copy of their image, but inspired/similar. Then you’ll want to try out similar fonts and images that you see from their pins so that you can get a feel for how others make pins (there are some great tutorials on YouTube for this if you want more tips and tricks!). Then, depending on how much you want to start off with, you can a/b test pin images (or a/b/c/and d test like how I do). A/b testing is where you create two (or more) different images and see what does better. Doing this will increase the chances of people clicking through to your blog. This is very important for getting readers. Another thing you’ll want to do is join other people’s group boards. So what are group boards? Group boards are boards where the owner of the board allows others to pin with them. So let’s say you get on a group board that is favored by Pinterest (which means Pinterest will show the pins that are saved onto that board to other people more often) compared to your personal boards… well, then your pins are going to get seen more. That’s the magic of Pinterest. Last Note: Just make sure that the majority of your boards are your own boards since Pinterest favors your personal boards more. So for instance, 30% of your boards would be group boards while 70% would be your own boards. Two, you can go on PinGroupie and search for group boards that fill your niche AND have a great following and repin rate (a high repin rate means that the group board has an active following that is pinning a lot of the content from that board). How do you find those two? Well at the top, there are drop-down lists and you can search for group boards with a high amount of followers and/or a high repin rate. Important Note: Do NOT be intimidated by how big of a following someone has or how exclusive it is. When I was just a new blogger on Pinterest, I had a small following, but I asked to be a part of as many group boards as I could and got accepted to many. Yes, I was denied many times, but I still got onto huge group boards with huge followings. Had I never taken the chance, my Pinterest account would never have been as big as it is right now. Pretty crazy right? Once you find the boards you want to join, email the board owner (if there’s an email provided in the board description) which will be the first person shown at the top when you click on one of the multiple profile images featured at the top of the page. If they don’t have that, go to their site and contact them from there. Now if they don’t have this either, comment on one of their most recent pins and ask to join (or send them a direct message on Pinterest). How to write the RIGHT kind of group board request: There are a couple of ways to do this. The first way is if the group board says they’re open for contributors (or doesn’t say otherwise). You can find this in the board description at the top. You want to be very polite and professional, saying that you love their content and would like to be added onto their board. Then let them know that you won’t spam and you will follow their rules. Second way: If the board is closed to contributors, this doesn’t mean that you shouldn’t apply, but you should apply differently. Them saying that the board is closed to new people in the board description is a boundary. So you don’t want to make them feel disrespected by ignoring that boundary. You want to acknowledge that it’s there by saying something along the lines of, “Hey, I saw that your board “blank” was closed to new contributors. But if it ever does open up in the future, I would love to be considered as a contributor.” Again, being professional and polite goes a long way. After that, you’ll want to join a pin scheduler like Tailwind which will pin your images for you to the boards you want. It’s a GREAT way to save time. One Last Way to Get Readers Onto Your Site: Also, if you want to learn how to get a reliable and CONSISTENT readership from Google to your site, then you should seriously consider taking this online course called Stupid Simple SEO created by SEO expert, Mike Pearson (SEO stands for Search Engine Optimization – basically, you’re creating blog posts that will be at the top of a Google search page). We’ve taken it and it REALLY helps get a lot of readers onto your site. You also get access to a private Facebook support group with Mike, downloads, checklists, & email outreach templates. It opens again on May 13th-17th, so be quick! We were in the SAME spot when we first started blogging! We were living paycheck-to-paycheck, so even buying something like hosting was a commitment for us. Hosting: It’s like renting out space on the internet for your blog. So instead of going with a free blogging site like Blogger.com (which is basically impossible to make money on), you purchase hosting so that you have FULL control over your personal site. So we cut back on the wants like getting coffee out or those extra items at the grocery store (sometimes we don’t realize how much money we spend on things we don’t need). And pretty soon we were able to pay for Bluehost. And the best part is… I don’t regret it. Getting hosting for my blog was the BEST thing I could have done since it allows us to make income (instead of using a free blogging site where making money on it is VERY hard). Think of it this way; you’ll be able to pay yourself back MULTIPLE times over what you spent on hosting. We sure did! You’re basically making a small investment now so that you can have greater time and money freedom later. Also, feel free to check out my step-by-step guide that will show you how to easily create your own blog here! Just a few months before our blog took off, I wanted to stop researching and blogging. I wanted to get a job so we could actually not feel like we were coming up for air every time payday came around. But his answers were things I could never forget because, without them, we’d still be stuck in northern Indiana right now. He asked me where I wanted to be in 5 or 10 years down the road? Working at the Dollar Store and surfing Facebook at night? Or did I want to be traveling the world and working when I wanted to work? He told me that he knew I could do it and we were going to make it out together. If it wasn’t for his encouragement and help, I honestly don’t know when we would have made it out of our situation. In my situation, opportunity cost was giving up the easy money I could have made working a part-time retail job, for the chance to make more than I had ever made before. Sure it hurt at the time, but it was so worth it! I totally understand when sweeping the idea of blogging under the rug feels like the easiest thing to do. It’s hard when you have children, or you’re working a full-time energy draining job. But guys, I’ve known moms going through a divorce who started blogging and made a full-time income and were able to stay home with their kids. And I’ve even known people with full-time jobs who started a blog as a side-hustle and quit when their blog started making more money than their job. Bali is a beautiful place! Nope! Thankfully Bluehost and WordPress have made it very simple. Now if you had come into the game 10 or 15 years ago… then yeah! Definitely hard. But thankfully, things have become a LOT simpler, which is great for non-tech-savvy people like you and me. PLUS, if you are having any sort of trouble with setup, there are people directly on the other end of Bluehost who are there to help you out as well as TONS of free tutorials (video and written) to guide you along. These two factors make the tech side of blogging simple and unintimidating. If coming up with a blog name is hard for you (it was for me! ), then you’ll definitely want to check out my husband’s post on finding the RIGHT blog name for you. It’s filled with great advice, no fluff, I swear! One of the simplest two ways to find time to blog is to narrow down and cut out. You want to narrow down on your focus right away. You want to find the main few things that will get you to where you want to go the fastest (like how I talked about in the question, #4. Where do I even start? It’s overwhelming!). So basically, the most important things. Then you want to cut out the unnecessary. Get rid of the blogging tasks that keep you overwhelmed and aren’t going to get you to those pageview (number of readers on your site) and income goal. Narrow and cut down in your personal life. Are there home tasks or errands outside the home you could delegate to someone else? Would you be willing to cut down on media time (like on Facebook or Netflix)? Because while those things are fun and entertaining, they’re going to keep you away from living a life with time and money freedom. They’re going to keep you away from spending more time with your kids, spouse, friends, family and dreams. They’ll also keep you away from getting ahead financially and paying off the house or credit cards and/or student loan debt. There are SO many things like this that keep us away from living our dreams. So find what those things are and cut the time you spend on them down or all together. You’ll also just want to analyze your life in general. There are probably things taking up too much of your time or mental bandwidth throughout the week. So make sure to narrow in on the most important things in your life right now so that you can blog and have more freedom later. 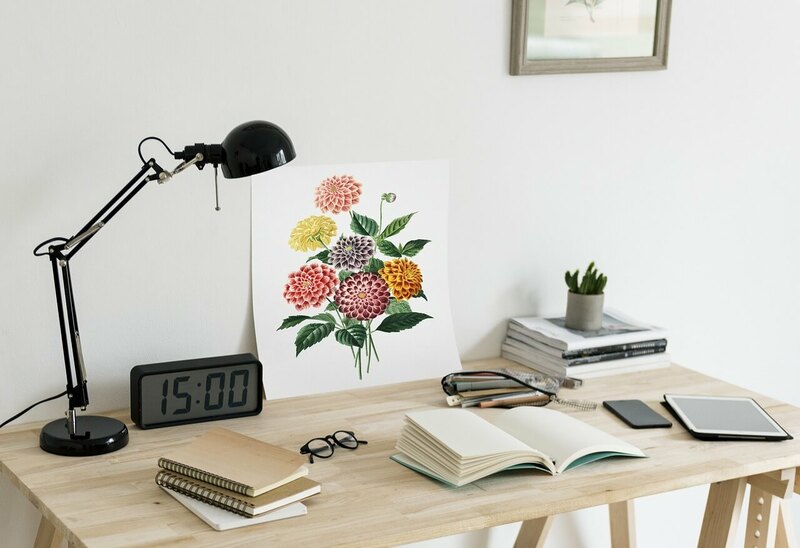 Time blocking is another great way to make time for blogging (Time blocking: a type of scheduling where you dedicate a certain amount of time to a certain task, instead of just working by the clock). If you just keep yourself to 1 hour doing a certain blogging task and 30 minutes for another blogging task, you’ll be able to work on the blog and not feel stressed out. The same goes for outside of blogging too. If you can time block your daily or weekly tasks or other parts of your life, then you can create more breathing room for blogging. And lastly, there are going to be times where you’ll need to sacrifice. I remember there were nights where I would stay up a couple of hours after my husband had gone to bed just to work on the blog. Those extra hours you work will make a BIG difference in your success. And it will get you there faster too. It’s all about the small sacrifices now for BIG rewards later. In question #2. I feel like there are too many people in my niche. Should I even bother? I go into detail on how you can look to other bigger blogger’s blog posts and see where they’re not adding value. This is a GREAT way to start brainstorming up awesome blog post ideas. You don’t want to copy them directly, but you do want to understand that the bigger bloggers are writing on those topics for a reason. And that reason is that they know that the topic they’re writing on is popular and will help out their big audience. They understand what’s going to pull in A LOT of readers since they’ve been blogging for a long time. They know what people want to hear about. Another great way to brainstorm blog posts is to go onto Pinterest and type in a topic like, “frugal living tips” or “weight loss tips,” (depending on your niche) and see what the popular pins at the top of the page are. These pins are popular because their topic hit home with a lot of readers. Then you can go into the person’s blog post and see where you can add value. Also, just keep a notebook or a place on your phone where you can write down blog post ideas as they come to you while you’re just living life. Last Note: Just make sure that the blog posts follow WIIFM, which stands for “What’s In It For Me.” Readers want to know how this blog post can change something big or small in their life. And they want to know how they can do it now, not at some point in the far-off future. So give them a title and subject that lets them know how they can solve a problem by reading your blog post. You can sign up to get my FREE viral blog post checklist here! I feel like this is almost EVERYONE when they first start out, so don’t feel discouraged! When you’re a new blogger, you’re just finding your voice and discovering how you like to write and what you like to write about. And one of the best ways to quickly get better is to read a few different bloggers throughout the week in your niche as well as outside your niche. This is a great way to get a feel for how others write and what their “blog voice” sounds like. Bloggers like Lindsay from Pinch of Yum (who is an amazingly talented and funny writer) who sound SO natural. But when asked about it in an interview, she talked about how she had to read multiple other bloggers to find her own blogging voice. Which was CRAZY for me since she sounds like a complete natural! So as you start in this process of becoming a better writer and learning how to tell stories and relate to your readers, one of the best things you can do is study the bigger bloggers. I want to let you know that if you DO start a blog, I’m here to help you along the way. So feel free to email me at chasingfoxescontact@gmail.com! PLUS! If you have any questions that weren’t addressed here, please let me know in the comments down below! I’d love to add them!